We’re big, big fans of homemade hamburger buns around here. Peek around and you’ll find Chipotle Buns, Jalapeno Cheddar buns, and Shiner Bock buns. Buns are more than just a vehicle to get from plate to mouth, although that’s their most important job. They’re also an excuse to add another layer of flavor to your burger. 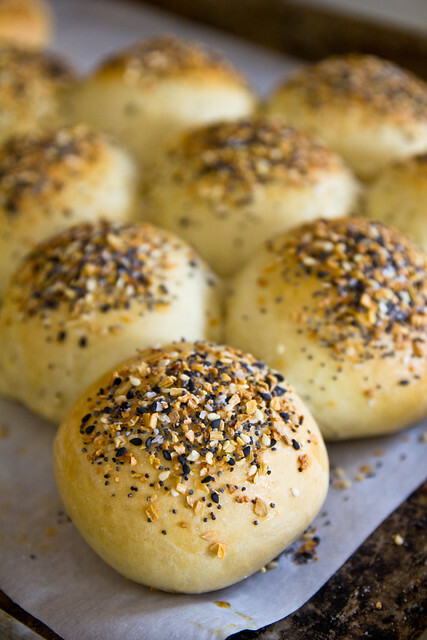 We took our favorite plain hamburger bun (and killer dinner roll) recipe and topped it with an “everything” mix of dried minced onion and garlic, poppy seeds, sesame seeds, and salt. That plain hamburger is suddenly a gourmet burger. And no one had to shell out $15 – or put on pants – to get it! 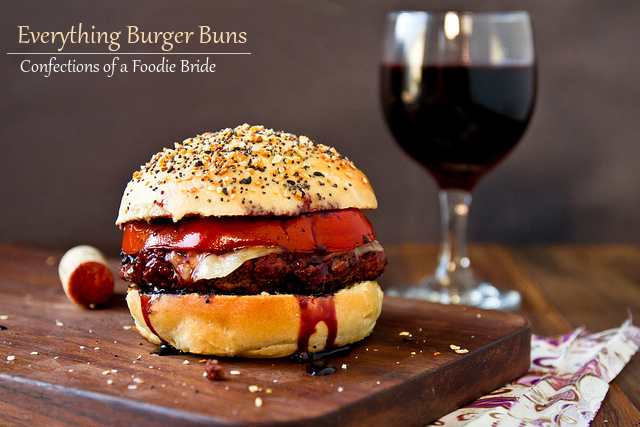 They make great sandwich rolls but we used the burger buns on an oldie but goodie: the Red Wine Burger. The savory Everything spice mix and grilled tomatoes cut the sweetness and paired nicely with the oaky merlot reduction. The classic bagel topping transforms an ordinary hamburger bun into a rockstar. Add warm water to the bowl of your mixer and sprinkle the yeast over top. Let sit 10 minutes, until frothy. Add the, oil, 1 egg, and sugar to the bowl. Add the flour and salt, mixing on medium-low speed with the hook until the dough holds together, about 2 minutes. The dough should clean the sides of the bowl. If not, add additional flour by the Tbsp. Increase speed to medium and knead the dough for 5 minutes. Transfer the dough to a large bowl that has been lightly greased with oil. Cover it with a damp towel and let rise in a warm place until doubled in bulk, 1-1 1/2 hours. Divide the dough in half and each half into 4-5 pieces (depending on the size of your burgers, I typically get 8-10 full-sized buns per batch or 14 slider buns). A kitchen scale makes this easy: 3 oz for burger buns, 1.75 oz for slider buns. Roll into rounds and flatten with the palm of your hand onto the baking sheet; placing buns about 1/2-1 inch apart). Cover with a damp towel and let them rise for 20 minutes + oven preheating time. Mix all ingredients for the Everything topping in a small bowl. Whisk the remaining egg with 1 Tbsp water. Brush the buns with the egg wash and sprinkle all of the Everything topping over the buns. Bake for 20-25 minutes, until golden brown. Let cool at least 10 minutes before slicing and serving. Store leftovers in a zip-top bag at room temperature. Oh man, these look amazing!! I can’t wait to make these buns (hehe) and the burgers. Oh yes! I’m in heaven. These look SO good. I haven’t made my own buns yet, largely because we don’t eat burgers THAT often, but I really can’t resist “everything” anything. Would it be inappropriate for me to say I love your buns?! Well, I DO! These look fab, Shawnda! There are a MUST MAKE. So creative and delicious! My husband’s gonna fall in love with your buns when I make these. Strangely, I’m ok with that. 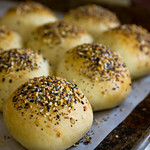 These look delicious – and I love everything bagels and buns, but have never made them from scratch. Adding these to the list, especially now that grilling season is finally here! Looks sooooo good! I love the fact that they’re sliders! I hope my burger buns look as good as yours. Thank you for the recipe. I’ve really never felt htat a burger is worth eating unless it’s on a good bun. (which perhaps may be why being a vegetarian works so well for me now :P) and given that everything bagels are one of my favorite bagel flavors…these buns would probably follow suit. This looks amazing – so tasty. What a great idea to turn an everything bagel into a burger bun! Brilliant! I love everything when it’s turned into “everything” flavor! …I just wish I didn’t hate waiting on yeast so much! Can I make these with whole wheat flour? Just asking! I frequently sub up to 50% whole wheat flour in bread recipes – expect a little longer rising time and hold back a bit of the ww flour since it absorbs more water than all-purpose (you might not quite use the full amount).